FAQ #1: You had quite a weekend. Assembling two sets of bunk beds and then a fifth bed, rewiring the lighting for most of the rooms, and installing two ceiling fans. So far, you only seem to be working at the new beach house. FAQ #2: You let your young children help you with DIY electrical work? Is that safe? M: No one’s been shocked so far, so that’s a huge win. It was a little touch and go when I was holding a nest of live wires and Sam kept asking if he could flip on the light switch. FAQ #3: Really?! That’s scary. Have you considered letting the kids help you with more appropriate projects? 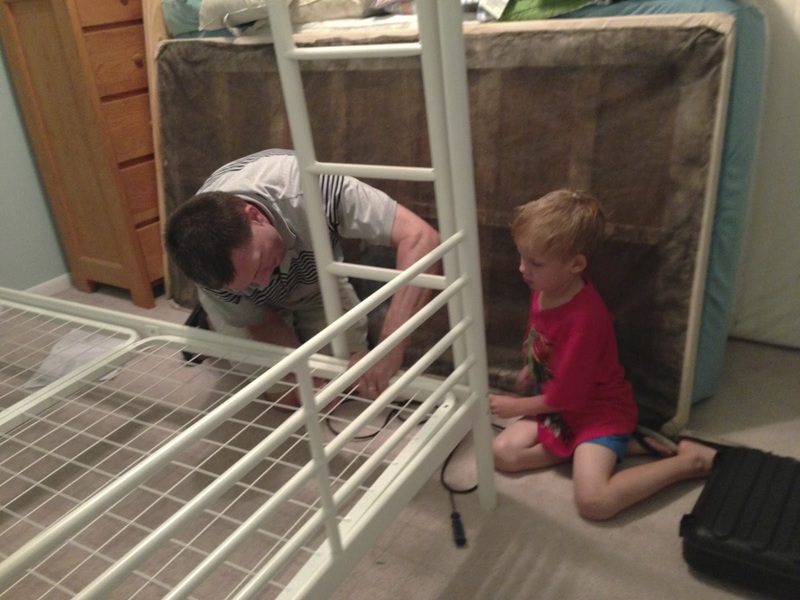 It looks like Sam is very helpful putting together these bunk beds.